The therapeutic powers of air, water and heat have long been used to stimulate and soothe both mind and body. Today these same vital elements combine in an Airbath, to provide a whole-body hydrotherapy experience unlike any other. The Appollo assisted bathing range is designed specifically around the needs of elderly, infirm or physically disabled users. With over 40 years’ experience in the bathroom industry, the range combines quality and reliability with the very latest in technology. Appollo features powered seats, walk-in facilities and wheelchair accessibility, there’s a solution to meet every requirement. So, if mobility problems are proving a barrier to relaxed bathing, take a closer look at the Appollo assisted bathing range. Roca designs reflect contemporary European styling and all products are manufactured to the highest standards. With Roca’s large range, there is a product to suit every need and budget. From the Davina with its gentle curves through to the neoclassical style of the new classical and the modern styling of the Emotion, you are sure to find something to suit your individual style. The British company Clearwater Collection manufactures "twin-skin" free standing acrylic baths from two sheets of 5mm acrylic. Adamsez manufacture a broad range of baths from luxury freestanding to corner baths, space saving and large baths. They also offer whirlpool systems for most of the baths. Mantaleda have been manufacturing quality G.R.P. bath tubs for over ten years. 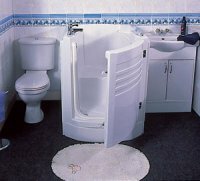 They particularly specialise in the production of innovative walk in baths, for the less able. Most of the Mantaleda assisted range of walk-in baths can be VAT exempt for disabled people. 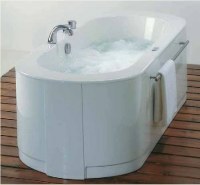 Bronte Whirlpool is a range of Whirlpool baths with a choice of whirlpool system to suit everyone. 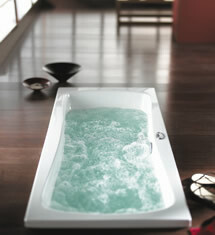 Airbath is a range of spa baths, featuring unobtrusive jets in the base of the bath. Both offer a range of hydrotherapy massage options for the height in relaxation! Bette of Germany is a quality supplier of a range of Bathroom products including Bette Steel Baths. The highest quality titanium steel baths, all individually made. With hundreds of styles and colours available, there is a steel bath for everyone! Call for a brochure or for advice on which Bette bath would be most suitable for your individual requirement.